Fancy doing all your accounting online? Here's a marketing story: a small UK design company couldn't find any bookkeeping or accounting software suitable for its Mac-only work group. Undeterred, the plucky team knuckled down and developed its own application, and did such a good job that it ended up with a commercial release. And what do you know? It started selling like hot cakes. This is the story behind Kashflow. This spiel struck us as odd as there are some accounting packages for the Mac that do an excellent job - MYOB's suite and MoneyWorks to name but two. The main difference between Kashflow and these betterknown products, however, is that Kashflow is a hosted service with an online interface. There is no download and install - you sign up online and manage your accounts. So we embarked on the free 60-day trial. Clearly, MYOB's features go into much more depth. In Kashflow you can't download and import bank statements, there is no foreign currency integration, the customisation of invoices and correspondence is clumsy in comparison, and so the list goes on. 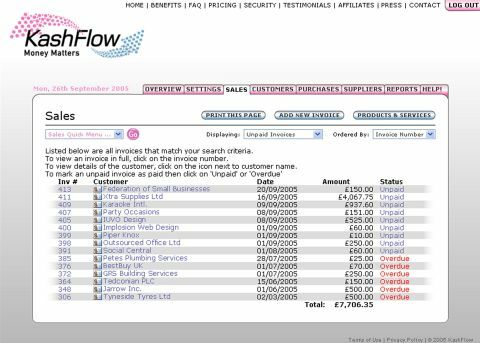 That said, Kashflow is perfectly adequate for just £14 per month or £150 per year, especially for freelancers who don't need an overkill of features. It also has a refreshingly visual interface, rather than the staid layout found in some other packages.